It’s no secret, I’m little red truck obsessed this Christmas season. And so is a certain red-headed little boy. Hudson and I decorated the mantle over the weekend and let me tell you this…..he is totally my child. He was giddy with excitement every time I pulled out a new decoration. And when I pulled out this new little red truck sign from Embellished Living he was in love. I went back and fourth over how to decorate since we are staying at my mom’s house. A lot of our Christmas stuff is packed away who knows where, but I did manage to find some of our stuff. And I’m loving how it turned out. The red tuck is the perfect addition to our mantle. (Merry Christmas sign from here, the various Christmas trees are from Target or Michaels a few years ago). I also wrapped the artwork that my mom had displayed above her fireplace with Christmas wrapping paper…..super easy and it makes a big impact! We usually don’t start decorating until after Thanksgiving, but this year we just couldn’t wait. Or Hudson couldn’t wait. Or I couldn’t wait. It’s a tie. If you follow me on instagram you already know I picked up this pillow too. I just love working with Jacy and Chandra from Embellished Living! They are so great to work with and always have the most beautiful things in their shop! 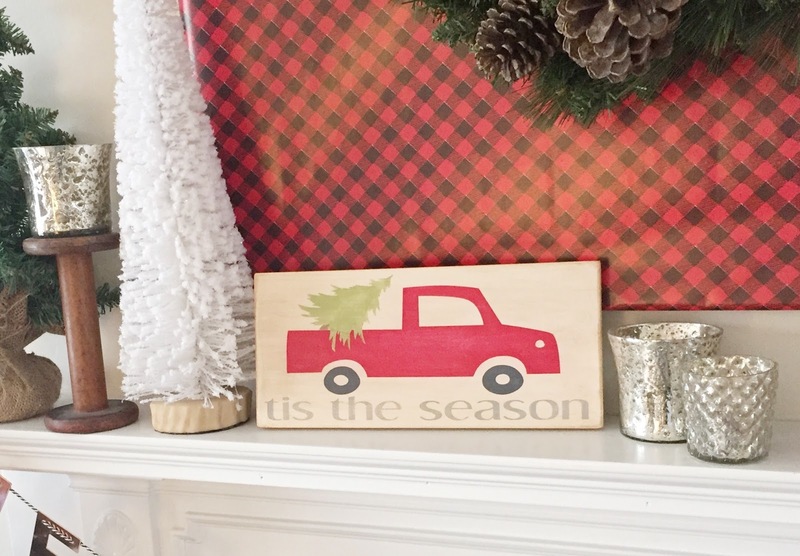 I fell in love with this red truck ‘Tis the Season sign and I had a feeling you all would too…..and luckily, you have a chance to win one! You can even customize the color of the truck! I’m also loving this sign with the camper...isn’t it cute? And I might need this one too. I can’t decide, I love them all! I think I might be able to cross a few names off of my Christmas list. Enter below for your chance to win a ‘Tis the Season Christmas sign, just like mine! Official giveaway rules available here. « Because I Love Personalized Jewelry…. I LOVE your mantle!! I so want to have a fireplace/mantle in our next home, I definitely miss not having one, especially at Christmastime when I see how pretty everyone decorates theirs! Isn't this year so much fun with the kids? Scarlett is so excited about all of the Christmas lights going up around our neighbourhood and just really getting into the magic of Christmas this year. It's fun to watch. Your decorating style is always on point, mama! 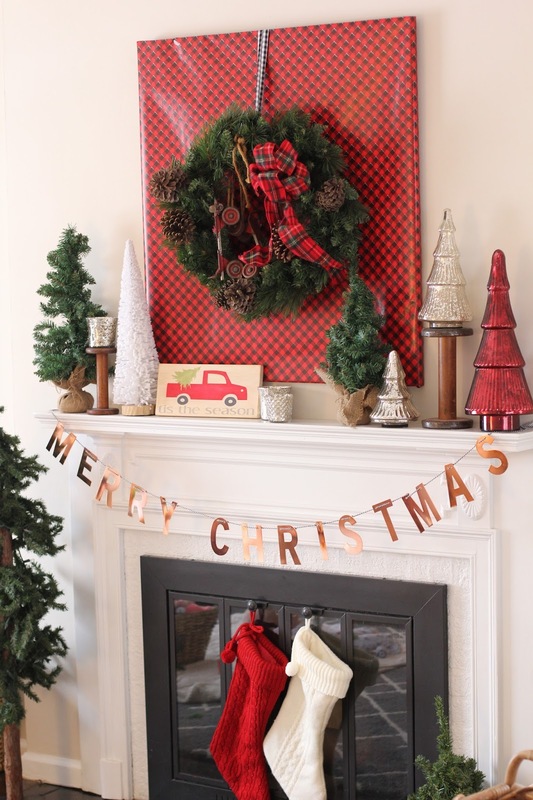 Love your mantle – and almost bought that truck pillow at Target over the weekend:) ^^^Agree with Elise, merry merry! Beautiful mantel! I love it and I'm totally digging the red truck thing going on this year! I'm shocked I haven't picked anything up with it yet!!! So cute! Well done you! I decorated my mantel this weekend too but am waiting to show it off until next week. I love the idea of wrapping framed art work. 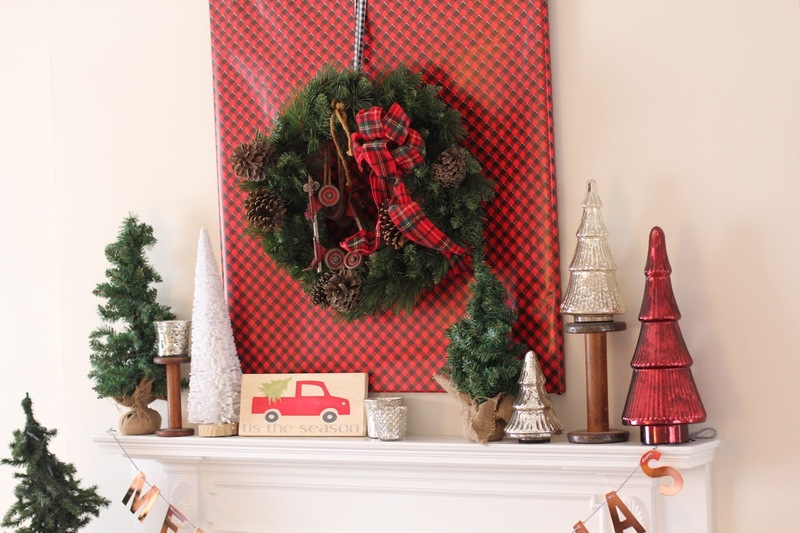 Easy way to add a little more Christmas to your home! Adorable! I have wrapping my frame on the list this year, hope it turns out as cute as yours! Super cute mantle. I really love the little red Christmas trucks too! I love that your mom let you decorate the mantle! What a fun holiday season to be back living with your mom again. One you will remember I'm sure! Decorating the mantel is hands down my favorite thing to do! 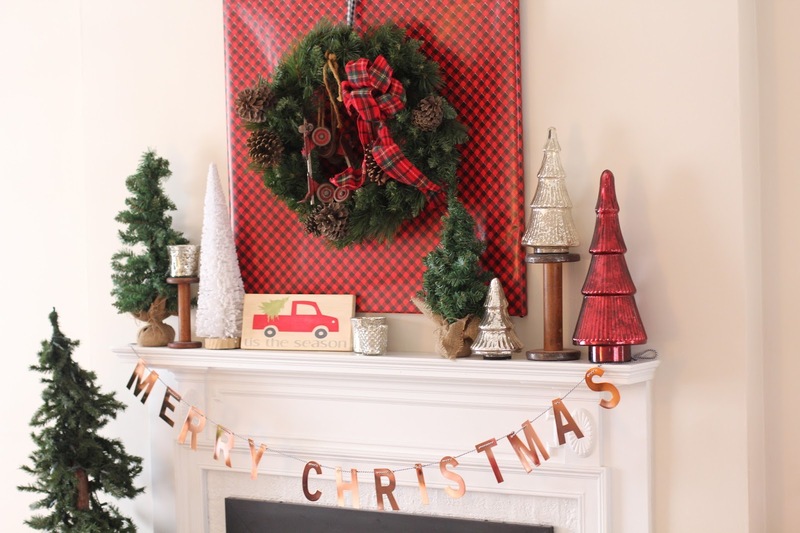 Yours is Christmas perfection with the gold, plaid and greenery. such a cute mantle! This house we have a wood burning stove instead of a big mantle and I miss decorating it!! and red trucks… super cute, always. Beautiful mantle! And I am obsessed with little red trucks as Christmas decor. 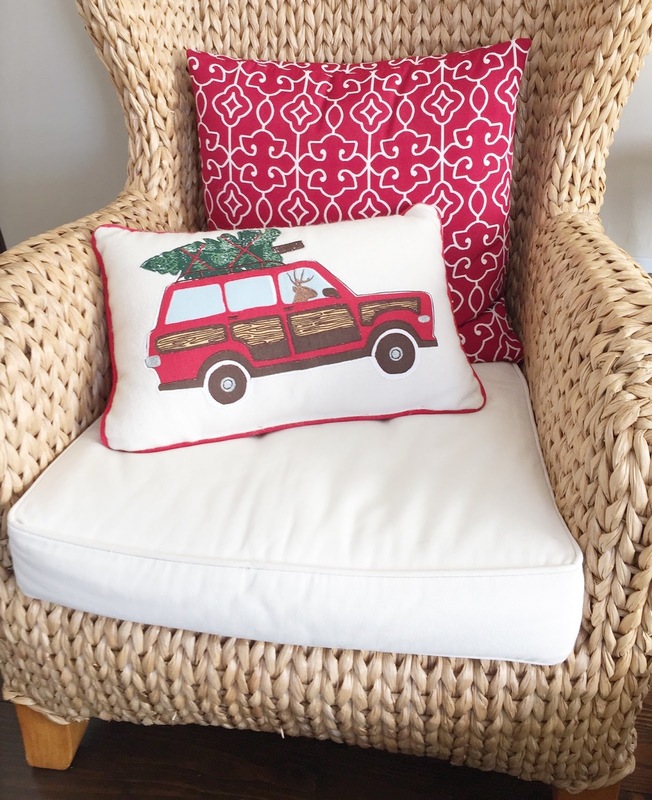 Target had several things that were red truck themed and I scooped them up!